As temperatures increase, seawater expands in volume and increases in level (thermal expansion). Temperature increases also contribute to glaciers and ice caps melting. The IPCC (2007) estimated that under an intermediate emission scenario (A1B), thermal expansion would produce between 0.3 and 0.8 m of sea level rise by 2300. This is mainly due to the fact that energy moves slowly from the surface to the deep parts of the ocean (IPCC, 2007). Understanding of sea level rises is still limited, mainly due to the understanding of the many different processes from which sea level rise is driven. Uncertainty is relatively high, and future projections (Fig. 2.3) range from 20 to 50 cm to 2050, depending on the emission scenario. Under the B1 scenario (the best case scenario), the likely changes in sea level range between 18 and 38 cm, while in the worst case scenario (A1FI), the likely change could range from 26 to 59 cm by the end of the 21st century (IPCC, 2007). .. i * » i.. Fig. 2.3. Time series of global mean sea level (deviation from the 1980-1999 mean) in the past and as projected for the future. For the period before 1870, global measurements of sea level are not available. The grey shading (left pane) shows the uncertainty in the estimated long-term rate of sea level change in the past. The line (middle pane, left) is a reconstruction of global mean sea level from tide gauges and the shading around the line denotes the range of variations from a smooth curve. The short line (middle pane, right) shows global mean sea level observed from satellite altimetry. 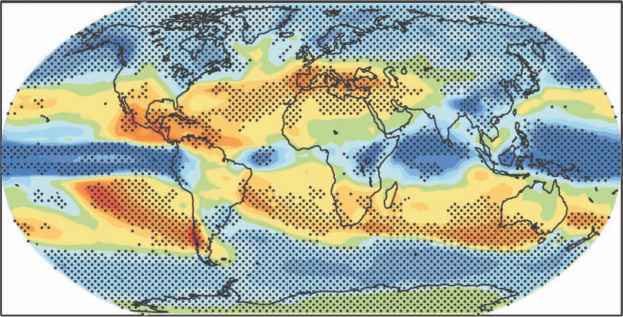 The shading (left pane) represents the range of model projections for the SRES A1B scenario for the 21st century, relative to the 1980-1999 mean, and has been calculated independently from the observations (adapted from IPCC, 2007). to have an impact for centuries to come. Flooding of coastal lands could therefore be a significant impact of sea level rise, in addition to salinization of soils and subsurface water in coastal regions. Nicholls (2002) estimates that 16-388 million people will experience flooding with a 55 cm sea level rise, with this figure rising to 510 million people under a 96 cm rise.